The emergence of several figure manufacturers from Eastern Europe has meant that subjects from this part of the world now enjoy far better coverage than previously. 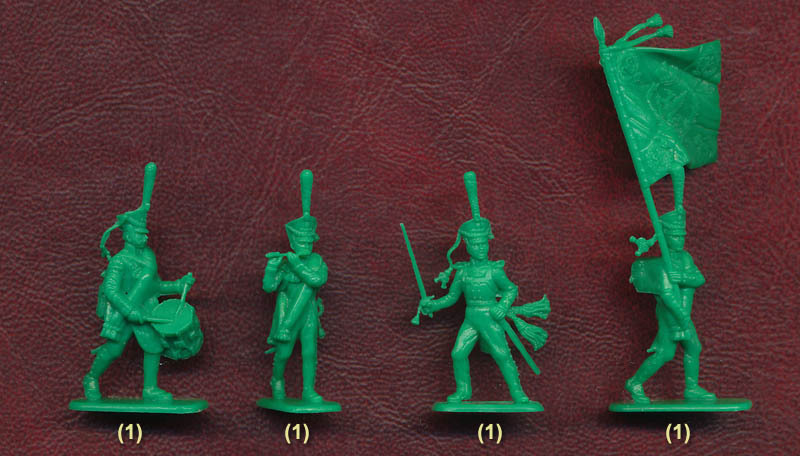 For a long time the only Napoleonic Russian infantry was the set by Esci, and though others have recently appeared this set from Zvezda is the first set to depict the men in the 1812 uniform and shako since Esci. The box states the figures date from 1812 to 1814, and the uniform details support that claim. All wear the shako introduced on January 1st, 1812, with the distinctive concave top and sloped sides, though it seems to have been modelled a little too tall on these figures. The men wear their greatcoat rolled and slung over their left shoulder, which was common practice. The uniform is correctly sculpted except that the collar is open, which means that the coats date to before 1812, when the collar was closed (curiously the box artwork shows the closed collar). However there would have been examples of the earlier style still on show in 1812 as troops waited for new stocks to reach them. The poses are generally those found in most sets of this kind, and that is no bad thing. Marching, advancing and firing poses account for all the ordinary soldiers, and all have been well done. The man pointing is a sergeant, as indicated by the fact that he holds his musket by the trigger guard and on the right shoulder. The musicians and flag-bearer are not so common, but it is nice to see them included here and they too have been well done. Unlike many sets the drum is of an appropriate size, and the drummer has his knapsack suspended around his coat tails to allow room for the drum on his back when not in use. The flag has been engraved on both sides with the normal infantry pattern which was in use from 1803 to the end of the wars. The set is identified as grenadiers, which is confirmed by the triple-flame grenade badge on the men's shako and cartridge box, and the tall plume. Other detail is also nicely done, with particular attention paid to the cords on the shako, which are flying around on those figures moving quickly, and in one case tucked around the plume to keep them out of the way - a common habit. The standard of sculpting is excellent with well proportioned anatomy and realistic, natural-looking poses. The technical quality of the set is impeccable, with absolutely no flash to be found anywhere. What more could you want?